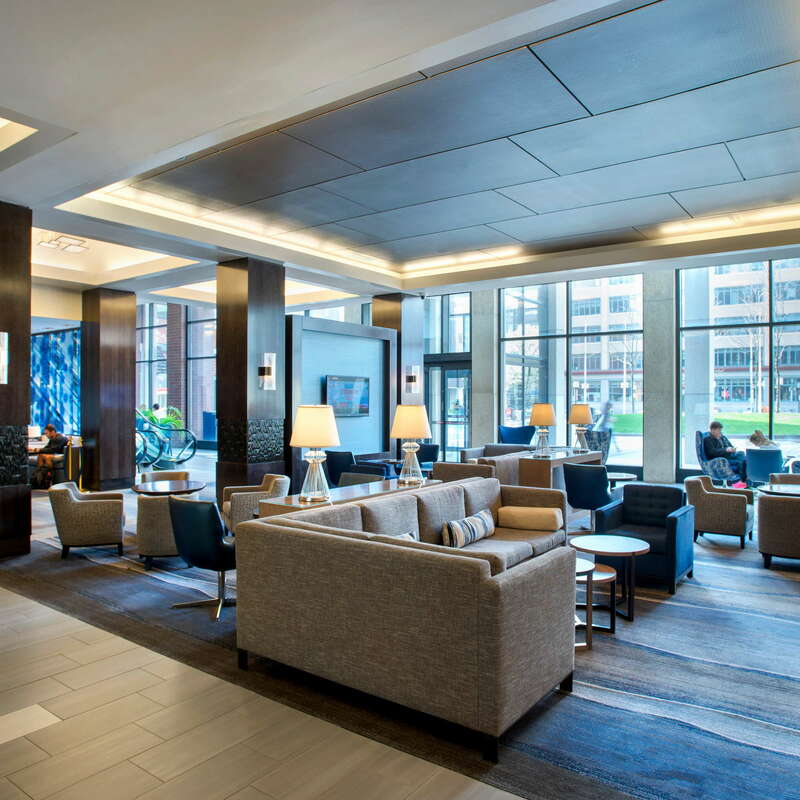 Traveling businesspeople and families like the modern look and efficiency of this 26-story high-rise hotel in Kendall Square, steps from the subway and MIT. 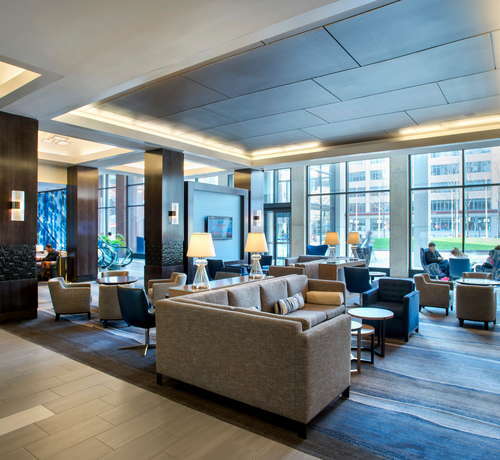 Right in the epicenter of Cambridge's tech scene, the hotel appears more modern than your typical Marriott. If you're heading to Cambridge for a graduation weekend, be prepared that you should book way ahead of time. 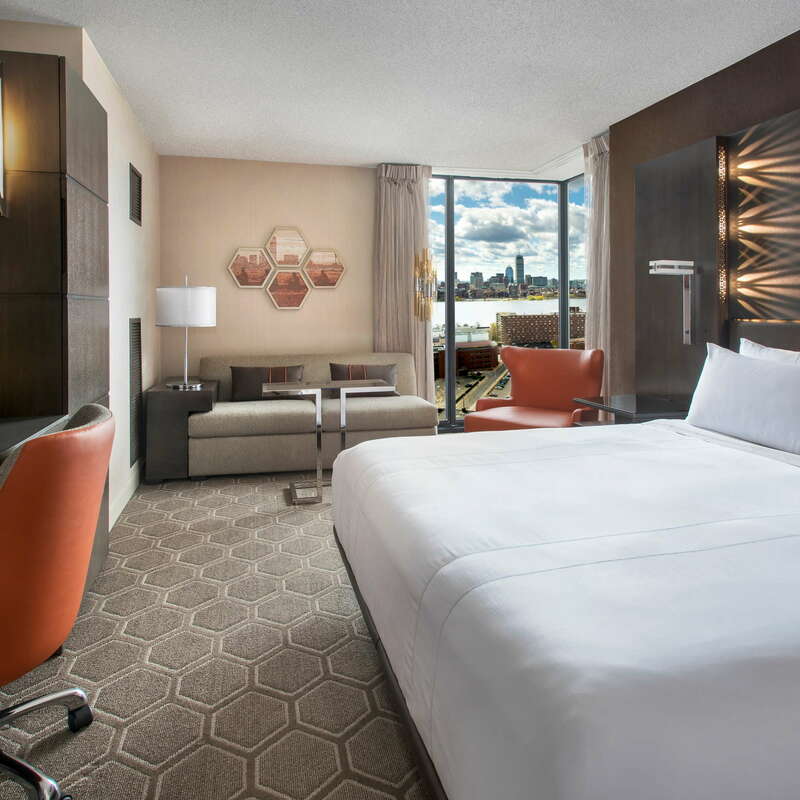 YOU SHOULD KNOW If you're 62 or older, you can save 15% off your nighty room rate. The rooms are quite contemporary, featuring masculine tones with small pops of color. The Revive beds feature crisp white duvets and fluffy pillows. Rooms feature flat-screen LCD TV's, coffee makers, work desks, alarm clocks, and a comfortable chair to relax in. 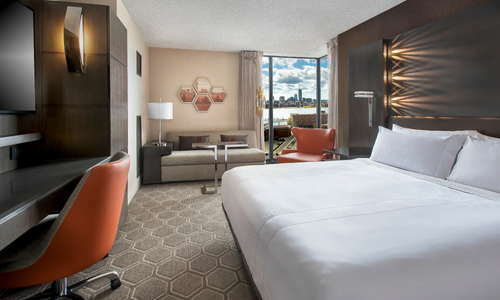 River View rooms have lovely views of the Charles from spacious windows, while standard rooms overlook the city of Cambridge. Book a room on one of the two concierge floors and score complimentary breakfast and hors d'oeuvres in the M Club Lounge. The bathrooms are actually quite sleek, with streamlined white sinks and spacious walk-in showers. Hair dryers are provided. 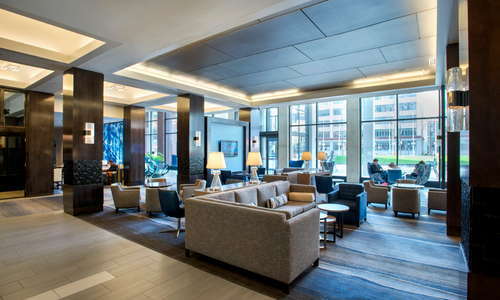 The modern and spacious lobby is a great spot to socialize or get work done, with plenty of houndstooth-print couches, tables and chairs, as well as a TV. If you're willing to pay the extra fee, the M Club Lounge is a bright and sunny spot overlooking Kendall Square. There is also an on-site Starbucks Coffee. There is an indoor swimming pool, as well as a whirlpool and sauna. The 24-hour fitness center is equipped with cardio machines and free weights. YOU SHOULD KNOW You must have special guest privileges to have 24-hour access to the gym. Champions, which serves classic American food, is open for three meals an day. There's even a pretty outdoor patio. An on-site Starbucks is available for breakfast and lunch. Champions, the hotel restaurant and bar, features a full bar, 20 flat-screen TVs, and a high-tech sound system. 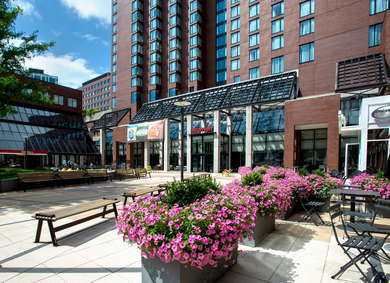 The Marriott is just across the street from the Kendall Square stop on the MBTA Red Line. The area is also very friendly to foot and bike traffic, as well. Kendall Square is ripe with restaurants, including the awesome Area Four (9-minute walk), a bakery and restaurant serving creative gourmet pizzas. (Don't miss their cafe side, either, which has delicious coffee). Around the corner is Tatte Bakery & Cafe (5-minute walk), a delicious spot for soups, salads, and Shakshuka. Kendall Square is filled with options for craft beer enthusiasts, like Cambridge Brewing Company (9-minute walk) and Meadhall (2-minute walk). If you're looking to be surrounded by Kendall Square's tech companies and MIT, there's no closer bet than the Boston Marriott Cambridge.